OKLAHOMA CITY (Mar. 1, 2016) – Edgemere Elementary, named in 1912 for its position on the edge of Oklahoma City, is now on the cutting edge of community engagement. The first community school in the city, it is reaching out to neighbors and area organizations who are working together to transform the struggling school into a thriving learning environment for its students, most of whom live in poverty. A trend that is growing nationwide, community schools act as hubs of the community, offering services not only to students but to residents who live near the schools. Each community school is as unique as its neighborhood. Some with onsite clinics open to the public offer primary medical and dental care. But community schools don’t have a universal checklist of amenities. Each tailors its efforts to its community’s needs. David R. Lopez Community School at Edgemere Elementary was named after the former Oklahoma Secretary of State and interim superintendent of Oklahoma City Public Schools, a key figure in the school’s transition from a traditional to a community model. Prior to Lopez and others’ involvement, the school was plagued by a negative reputation and low test scores. There is a significant amount of low-income housing in the area, and 94 percent of students qualify for Title I services. In only the second year of its five-year pilot program as a community school, Edgemere is already making a difference. Edgemere has not shown a need for its own clinic, but thanks to a partnership with Sunbeam Family Services, one of Oklahoma City’s oldest social services organizations, a full-time behavioral therapist is onsite to offer mental health counseling to students and families. Principal Alisa Stieg said the work of the therapist, provided at no cost to the school, has made a significant impact on students’ attitudes. She described one who overcame chronic disciplinary issues that were putting him on a path to possible repeated removal from the classroom. 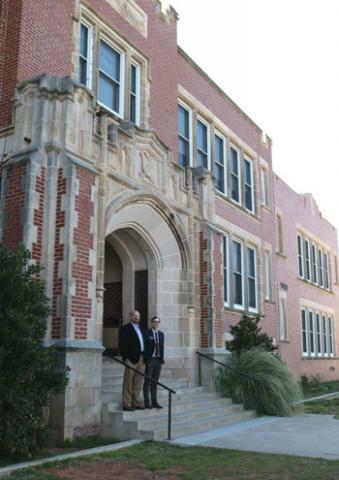 The Oklahoma Publishing Company, which recently moved to downtown Oklahoma City, began partnering with Edgemere this school year. Each afternoon, employees from the company volunteer at the school as mentors. Joshua Hutton, a marketing copy editor, works one-on-one with a third-grade student every week, reading books and playing word and math games. The program, he has noticed, raises kids’ confidence and skills and boosts his own morale. The student he mentors, who at the beginning of the year was reluctant to read, now becomes impatient that he is taking too long during their Scrabble matches. “There are so many times you do volunteer work and you don’t really see tangible results, but when I go each week, I see progress,” Hutton said. Stieg, with her duties as site administrator, liaison to the district and supervisor to the 16 certified teachers at Edgemere, cannot devote the time needed to develop these deep community partnerships. Enter Edgemere’s full-time community school coordinator, Colin Strickland. Strickland’s position, Stieg says, is a game-changer when it comes to the success of a community school. Strickland meets with community leaders and facilitates the work of site teams who brainstorm strategies to enhance opportunities for both school and community. At the beginning of the program, the school had willing volunteers, but it was unclear what volunteers needed to do or the projects they should undertake. “They wanted to be involved, we wanted them to be involved, but what was the best fit? Community partners are now finding their lane on the way to helping,” Strickland said. For instance, if a child needs shoes, Strickland knows which church to call and within hours can have a pair of shoes for that student. With their personal needs fulfilled, children can come to school ready to learn. “Being able to have everyone who wants to be part of that conversation sit down at the table is time consuming, but it’s extremely valuable because we really find out what the community needs from us,” Stieg said. Strickland says there are four steps in the development of a community school: exploring, emerging, maturing and excelling. He says it is not necessarily a linear process, which allows the school opportunities to re-evaluate the needs of an evolving community. “Looking forward, I think those community partnerships are interested in what is the next step. They’ve seen us come this far. They want to play a part in the next things we’re looking to do, whether it be after-school programs or early childhood development,” Strickland said. Edgemere owes its success to an unlikely group of supporters. Friends of Edgemere, a group started in 2007 by residents without children in the school, wrote the initial proposal to create the community school. Brian Wilks and his wife moved to the Edgemere Park neighborhood after his children went to college. The struggling school seemed isolated, so Friends of Edgemere organized to raise the profile of the school and be a surrogate parent-teacher organization when the school’s PTA was faltering. Wilks, one of Friends of Edgemere’s first members, said the group started out with modest contributions – providing supplies to teachers, for example – and worked its way up to raising money for computers, playground equipment and interactive whiteboards. It has since formed into a nonprofit organization. While the exterior of the school building is a proud historic landmark, the interior now boasts a bold, colorful modern décor. Friends of Edgemere even provided window treatments throughout the building. Community groups are vital to providing conditions for learning, said Wilks, who wants more residents to step up and contribute to their neighborhood schools, whether or not their children attend. “I hope that we can have more schools take our approach and pave the way for the school to become more of a collaborative community effort than the district going it alone. A lot of times, people think the school district has a job to do: ‘They teach our kids, and that’s all they need.’ That’s not the way a school works. A school is a lot more than just teachers, principals and administrators teaching kids,” Wilks said. Friends of Edgemere’s goals include making teachers feel appreciated and keeping children engaged by removing barriers for them to be in school. The school aims to be an environment where students’ physical, social, emotional, behavioral and academic needs are met. “The most important thing about community school is opening it up – having it be a place of community and not a sterile place in a vacuum. It’s supposed to be a place where more things are going on,” Wilks said. Wilks warns that progress takes time. Friends of Edgemere acknowledges that the school is several years away from achieving premier status, but through collaboration, the community has changed its trajectory. School officials and community partners believe they are on the right track, often in ways that cannot be measured. The change in attitude is important to success. Stieg cited research that shows when children are positively engaged in school, it improves educational outcomes for them socially and academically. Posters line Edgemere’s halls, reminding children that they R.O.C.K. – and are respectful, optimistic, courageous, and kind. Strickland said it will take time for all residents to respond to the changes within the 180-student school that has made a 180-degree turn. He and Steig hope the community school model impacts a significant number of students so that the district and community embrace the reform initiative and replicate it across the district. Despite the big problems facing schools in the district and the state, Wilks is committed to helping Edgemere Elementary, even if he can only contribute in small ways. Photos: State Superintendent of Public Instruction Joy Hofmeister sits with pre-K dance partner Briseyda Garcia during a February visit to Edgemere Elementary in Oklahoma City. 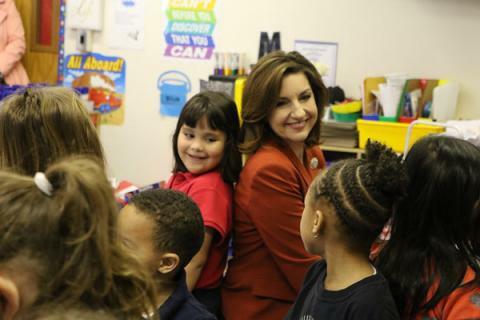 State Superintendent of Public Instruction Joy Hofmeister joins pre-K students on a February visit to Edgemere Elementary in Oklahoma City. State Superintendent of Public Instruction Joy Hofmeister met with the 180 kids of Edgemere Elementary during a February visit. Edgemere Park resident Brian Wilks and Edgemere Elementary’s community school coordinator Colin Strickland are working together to build partnerships within the community that are changing the school’s trajectory.